Thai meals are rarely followed by a dessert. If they are, it is usually just fruit - we've added stem ginger ice cream for indulgence. Cut the pineapple (including the leaves) lengthways into 8 wedges. Slice the papaya into 8 wedges (remove and discard the seeds). Arrange on a platter with the physalis and lychees. When ready to serve, cut the passion fruit in half. Scatter the seeds and juice over the fruit. 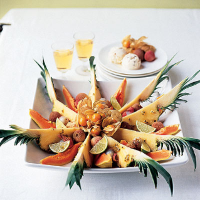 Serve with scoops of the ice cream, and lime wedges to squeeze over the fruit. Prepare the fruit to the end of Step 1, cover and place in the fridge for up to 6 hours. Remove the fruit from the fridge and the ice cream from the freezer 10 minutes before serving. Continue from Step 2. Brown Brothers Late Harvested Orange Muscat & Flora, Victoria, Australia, £5.99 for 37.5cl (£11.98 per 75cl). Fragrant aroma, with honeyed apricot, orange and lime flavours.